LONDON, England (CNN) -- FIA presidential candidate Ari Vatanen believes that Nelson Piquet Jr should have been punished for his role in Formula One's "Crashgate" affair. Ari Vatanen hopes to succeed Max Mosely as boss of motorsport's governing body, the FIA. 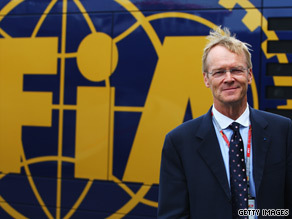 Vatanen told CNN: "I do not understand why Nelson Piquet Jr wasn't punished. For me his immunity was not correct." The former world rally champion, who is hoping to succeed FIA president Max Mosely was scathing of Piquet Jr's behavior throughout. "He only went public after he was sacked," Vatanen said. "He should have said no in the first place. If someone is crazy enough to propose something like that you say no. He should have been given a sentence." Much of the criticism until now has focused on the perceived leniency of the Renault team's punishment of a two-year suspended ban plus paying the costs of the investigation. But Vatanen thinks that they have been treated fairly. "It would be wrong to punish a team severely who is totally unaware of what a few individuals are doing. In that sense the verdict was right." Vatanen prefers to look at the "Crashgate" punishments from a different perspective. The question, he thinks, shouldn't be why did Renault get off so lightly? But rather, why were McLaren treated so severely two years ago? "In the light of the Renault punishment, McLaren [who were fined $100 million for spying on rivals Ferrari] received a gross miscarriage of justice," Vatanen said. He also called into question the timing of the most recent FIA investigation. "Allegedly, Charlie Whiting [Formula One's Race Director] was told by Nelson Piquet Sr about it last year. If that is true it should have been investigated immediately. You must examine the telemetry even if someone is only hinting that this has happened. "We must be consistent, If they [the FIA] did know, why didn't they do anything? Was it because it would have altered the championship in a way they did not like. That's incredibly serious if that is the case," Vatanen said. The FIA -- motorsport's governing body -- announced their decision on Monday, but it has done little to dampen speculation and stories continue to spill out in its wake. Evidence submitted to the "Crashgate" enquiry which was made public on Tuesday only serve to fuel the controversy further. In evidence submitted to the FIA, Pat Symonds, Renault's former technical director, said that it was Piquet Jr who first suggested the idea of crashing. Furthermore, Flavio Briatore's fate was sealed by a member of the Renault team, known only as "Witness X", who blew the whistle on the whole sorry affair. Vatanen, who is running against the former Ferrari team boss, Frenchman Jean Todt to succeed Mosley is promising consistency and an end to what he calls "selective justice" if he is elected. "Any federation is vulnerable without checks and balances. If they aren't there an organization moulds itself around the leader. That's why we need to refresh the FIA's democracy. Stagnant water starts stinking." Since Vatanen officially threw his hat into the ring last July, he has struggled to make an impact against his higher profile rival Jean Todt. But the recent scandals in Formula One will surely help his campaign against the Mosely-endorsed Todt. "The circumstances of today are making people realize that more of the same is not the answer," Vatanen said. "It's a cliché, but we really need change. We cannot do that with the old personnel." Vatanen retired from motorsport in 1998 to pursue a career in politics. He was a Member of the European Parliament for a decade before standing for the FIA presidency. As well as campaigning for a more democratically run FIA, Vatanen has been stressing the importance of mobility as a keystone of a free society and a vital tool in eradicating poverty. The election for the FIA president takes place on October 23. "We need a break from the past," Vatanen said. "I'm proposing a new cabinet, with new people -- who are not all perfect -- but clearly don't pretend to be the owners of the federation but its servants."